FOR USE ON SPORTS FIELDS, GOLF COURSES, and LANDSCAPES. West Coast Turf’s Bayside Blend combines 80% Kentucky bluegrass and 20% perennial ryegrass for a classic blue-rye lawn with superior disease resistance. It is tolerant of wear and shade, has improved heat and cold tolerance, and remains green year-round in much of the Southwest. 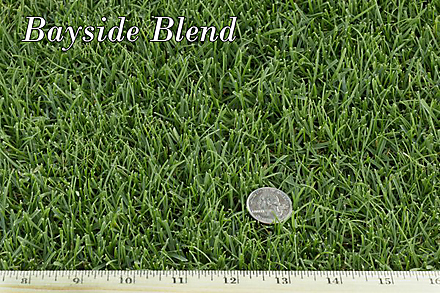 Bayside Blend provides a carpet-like turf that can be mowed as low as ½”. Durable, and wear tolerant with rapid recovery. Dense and upright growth habit. Respectable heat tolerance and superior cold tolerance. Remains active in winter, and stays green year-round in many parts of the Southwest. Natural dark-green color means less nitrogen is required. Requires full sun most of the day. ½” to 3” with reel mower.